"The best answer to that has to be thank you! We feel sure you will not be disappointed!" 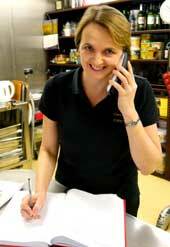 The key elements to this business have to be, great food produced in a caring way with innovation, skill and passion. With over 35 years of catering experience to fall back on there is no doubt, we are one of the best and leading catering establishments around. We work very hard at maintaining high standards throughout our business. From customer interaction to the food on your plate. 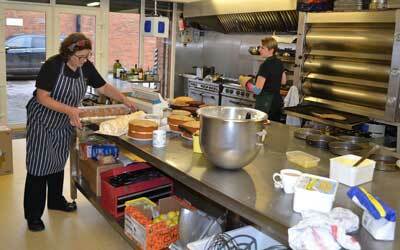 We produce the best quality food for all sorts of different gatherings, weddings, office lunches, birthdays, cafes, restaurants and even other caterers. Our work is always very varied and we like a bit of a challenge! Food trends are always being reinvented, so we have to be contemporary, by continually striving to produce imaginative, exciting and of course great tasting food. It is very important that our food looks good, as you browse through the pictures of our website, you can be confident that they really are our pictures, of real food that we have produced. The ingredients we use are well chosen for their quality, and where possible we use, fresh, local, organic and Fairtrade. This is very important to us as this reflects in our final product. Value for money is a big topic, but we are very affordable and not exclusive, we endevour to give you the best attention, and the same quality of food, whatever your budget. We spend a great deal of time making sure we offer you the right products to fit your personal needs. Whilst you browse through the pages, you will notice the great choices that are available to you. Now the menus are not set in stone, as we specialise in bespoke menus, where, with our help, you make the right choices and include your own special preferences. There is a multitude of experience available to help you plan your event and choose the right menu for you which will make your event even more memorable. Whether it is a small intimate gathering or a large flamboyant wedding, we will make sure you have the best advice and quality of produce that you deserve. We produce for a wide range of clientele. 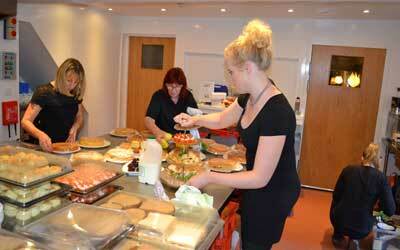 A large area of our work involves wedding breakfasts, which always command a great deal of planning and preparation. Our advice is honest and practical and is free! You can feel confidant that we are good at what we do! Since relocating to our custom designed premises two and a half years ago, we really went up a gear, to become more efficient and establish a better working environment for us all. 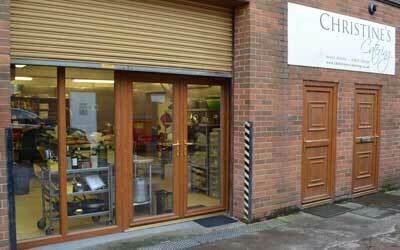 We have a 5 star food hygene rating with Herefordshire Council, and you are welcome to visit the premises. We are a small company that have a great deal to offer. We have lots of energy and enthusiasm for what we do and it shows throughout our work. We make great plates of food! We have plenty of customers who repeatedly book us time and time again and give us great testimonials. Me? I just love to cook------Anything! My working life started by producing confectionary goods for café, shops and restaurants around Hereford, and it has not stopped! In 35 years there has barely been a day when I, haven’t cooked something. Being creative with food is a real life passion. Using lovely ingredients to produce delicious food is an art form. Taste trends are continually being re-invented to create modern and contemporary dishes which I try passionately to bring to the table. I’ve been lucky to have travelled different parts of the world, to see different cuisines and source lovely ingredients and see how they actually are grown and look and see how they reach our plates. I’ve always run my own business and from small beginnings the firm has grown into a thriving, vibrant, established company. Over the years, I feel I, have built up an excellent reputation for producing some of the best food available anywhere. A complete understanding of the customer requirements is vital and some of the original clients I, started with, are still with me today- that makes me very proud. 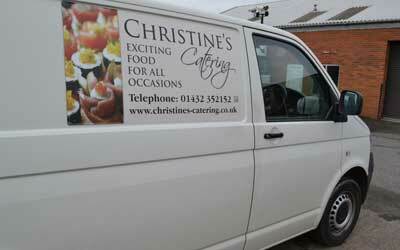 Amanda first joined Christine’s Catering over 10 years ago in the role of Bar Manager for licensed events. Since then her role has grown and is now Operations Manager. This role involves taking bookings, organizing events and using Amanda's meticulous attention to detail to ensure the smooth running of all our functions. 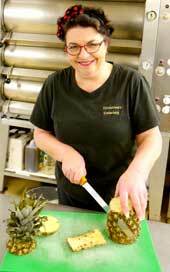 Amanda also have a keen involvement in the production side of the business and alongside Christine & Tim, enjoys producing all types of confectionery, but most especially cakes & desserts. Here is a selection of our many clients. Total Produce UK has become one of the UK’s largest and most accomplished fresh produce providers.